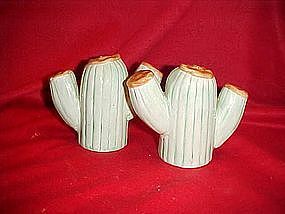 Nice large cactus salt and pepper shakers are made of hand painted glazed ceramic. They measure 3 1/2" tall and have their plastic stoppers. Perfect condition and would look wonderful in your southwestern theme kitchen. See my catalog for the matching cookie jar.